Natural Herbal Medicine To Cure Cold or InFluenza - Flu or commonly referred to as a cold is one of the diseases caused by viral infections on human respiratory system (throat, nose, and lungs). Influenza disease can occur due to RNA viruses belonging to the Orthomyxoviridae virus group that incidentally is an influenza virus. 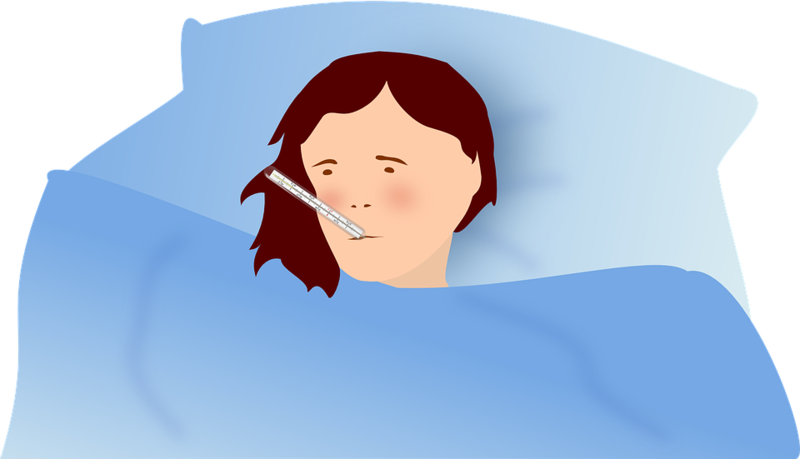 This flu or cold disease can be easily transmitted from flu sufferers to others. Flu can be transmitted through the air, direct contact with flu sufferers, food sharing, drink, and also when sneezing. Someone who exposed to influenza, usually have a problem with their respiratory activity in the nose due to mucus in the nasal passages. In addition, flu usually also accompanied by cough and mild headache. For that, we must immediately overcome this ilness. So, what are the natural flu remedies that can be used to treat colds? And how to cure the flu naturally? To find out please refer to the discussion below. One of the main causes of a person suffering from flu or cold is due to a viral infection. One of the viruses that can cause colds is the RNA virus. This virus is one type of virus that is grouped into the type of virus Orthomyxoviridae is the type of influenza virus. Changing the weather or changing seasons from the rainy season to the dry season or vice versa or commonly known as the transition season usually causes the condition of the human body's defense system becomes weak. This affects the vulnerability of the body attacked by various diseases, one of which illness flu or cold accompanied by this cough. Some people have allergies to certain foreign substances that entering the nose. Some people is allergic to dust that can cause sneezing, cold or flu. Body condition is not prime cause the body vulnerable to various diseases. When the body's defensive system weakens cause disease easily attack the body one of them is this flu illness. Cold drinks can also be one of the factors that cause colds. For some people, eating ice drinks can result in a cold. People who do not regularly consume cold drinks will be susceptible to colds as they try to consume ice or cold drinks. This is because drinks that are too cold can stimulate the production of mucus. You can use ginger as an herbal ingredient to cure cough. Ginger is generaly known has anti-viral compounds that are useful to help eliminate viruses that cause flu and cough. Some types of ginger like regular ginger and red ginger have been widely used as a traditional medicine to relieve colds and coughs. Ginger contains gingerol, essential oil, terpenoid zingiberol and shogaol which is a compound that is widely used as a cough medicine. How to make ginger potion to treat cold, it is easy, take some ginger segment, then wash it to clean it, then mash the ginger. Then put it in a glass of warm water, then add honey to give taste as you like. Stir thoroughly and drink the potion twice a day. Honey has some properties that can act as an antibacterial that can increase human body immunity. Honey can be used to help relieve cough and colds. Honey can reduce irritation of the larynx. you can mixing pure honey with lemon to drink to help ease a cold cough. However, honey should not be given to children under the age of 2 years. One of the most commonly used herbs for curing colds is peppermint. Peppermint contains a natural chemical compound called menthol. The benefits of menthol is able to thin the phlegm and mucus in the respiratory tract and is able to reduce the pain in the throat. You can make a glass of peppermint tea by adding pure honey to give it taste. Then drink 1 to 2 times a day to help relieve flu and cough. You can also use traditional ingredients such as garlic as a herbal remedy to help cough colds. Garlic contains substances that have mild antiviral properties and can strengthen the immune system. You can eat garlic by mixing it on your daily diet. Elderberry Extract is a plant originating from Europe which is widely used for many kind of diseases treatment, of one of them is to relieve nasal congestion and other respiratory disorders. Elderberry extract has beneficial as an antiviral as well as anti inflammation that is useful to help increase endurance and fight the illness of flu. Honey has antibacterial properties that can reduce irritation of the respiratory tract. You can use a mixture of honey and pepper as a traditional medicine to help cough flu. You can mix 1 tablespoon pepper powder with 1 tablespoon of honey on a glass of water that has been boiling. Stir it, then drink it befor it cool. Drink this potion 1 to 2 times a day to relieve your cold. however, you should not use this herb to treat colds and coughs on children. A simple way to help relieve a cold cough is by gargling with salt water. Gargling using a salt water mixture is useful to help moisturize the throat. You can rinse with warm water mixed with salt, turmeric, ginger, kencur or apple vinegar. Gargling with these ingredients is also useful for cleaning the bacteria that exist in the mouth that causes flu and cough. To help speed up the healing process, you can also drink traditional herbs from a mixture of honey and ginger. Although honey has a sweet taste, but the sweetness in honey does not cause coughing and itching in the throat. Honey is very nutritious to relieve symptoms of cough and colds, by mixing honey and ginger can accelerate the healing process. How to make potions are: First boiled ginger slices with a glass of water to boiling, then lift and chill. Add a tablespoon of honey while stir well, then drink until it runs out while warm. Perform treatment by drinking the concoction 2 times a day 1 cup until healed. Traditional medicine from a mixture of lime juice and soy sauce has been trusted since long ago to treat colds in Indonesia. How to make it, you just to squeeze 1 lemon, then add 1 teaspoon of sweet soy sauce. Stir it well and drink, do this treatment as much as 2-3 times a day until your flu is healed. Additional information, Hot orange juice has many benefits for the health of the body, one of which can relieve flu, cough and cold. In addition, the content of vitamin C is very high able to improve the system of body awareness and restore stamina. Routine drinking warm lemon juice every morning and night before bed can you try to do until healed. Boil some water in a pan, then pour it into a container such as a basin or small bucket. Then position your face on a bucket or basin with a distance of about 30 cm from water surface, then cover your head with a towel. After that, inhale the steam that comes out from the hot water and do this way for 15 minutes or until the vapor runs out. For maximum results, you can add eucalyptus oil so that the aroma can relieve nasal congestion. Do this way every day until healed at least 1 time a day. Those are some ways to treat colds, coughs and colds naturally, with you using this natural or traditional way, hopefully the above health articles can be useful for all of us. Thank you and hope you get well soon.